Seven has now confirmed launch dates for Australian and international titles including The Big Music Quiz, Selling Houses Australia*, The Durrells and Code Black. Chicago Fire is also returning, along with previously-noted Home and Away, 800 Words and Winners and Losers. The Big Music Quiz premieres on Sunday 28th with a timeslot yet to be confirmed. Get ready to thaw out under the Mediterranean sun on Wednesday, August 24 at 8.50 pm for The Durrells premiere. Based on Gerald Durrell’s much-loved Corfu trilogy of novels, this beautifully shot and heart-warming series sees an impoverished but sparky widow, Louisa Durrell (Keeley Hawes) make the radical decision to seek out a new destiny for her family when her options in late 1930s England are limited. Concerned that the lives of her four children, are heading down the wrong track, she relocates her reluctant brood to a dilapidated house in the Greek sun. Tune into the free-to-air premiere of Selling Houses Australia on Thursday, August 25 at 8pm. Hosted by property expert Andrew Winter the series follows home owners who are having difficulties selling their place. Landscaper Charlie Albone and interior designer Shaynna Blaze team up with Andrew to initially assess the property, and then proceed with a renovation to boost the property’s appeal and salability. The property is then put up for sale and the result is shown at the end of each episode. In tonight’s episode the team are tasked with modernising an old Queenslander which is stuck in a time warp. Can they transform this museum piece into a comfortable family home? Don’t miss the Code Black premiere on Thursday, August 25 at 9.10pm. This heart-pounding medical drama takes place in the busiest ER in the nation, where the staggering influx of patients can outweigh the limited resources available to the extraordinary doctors and nurses whose job is to treat them all – creating a condition known as Code Black. Inspired by the award-winning medical documentary by Ryan McGarry, tonight’s episode sees Residency Director Dr. Leanne Rorish (Marcia Gay Harden) put her four new first year residents to work immediately in the busiest, most notorious hospital ER in the nation – Angels Memorial Hospital. * Selling Houses Australia is a Free to Air premiere of a season which has aired on Foxtel. Having been spoilt with the Olympics in HD, I’ve no doubt Seven will revert back to standard definition next week. The HD channel being 7Mate for Sydney again. Bet The Bachelor will run to 9 or 9:10pm, covering the start of The Durrels. Zumbo -v- The Bachelor. No bets being taken on who will win that fight. I was right, My EPG stated 800 words at 8:45pm. Why couldn’t they have changed their tune and made the Zumbo show go for an hour rather than 75 minutes (it is on 3 times a week) This highlights that they need stricter controls (I know it is a deliberate strategy, but it annoys me)! 8:45 will be 8:53…. 8.50 is a dumb time for a premier. They could have at least started the first episode of The Durrells at 8.30. Why does Zumbo have to go for 80 minutes? The Durrells at 8.50, too late. Oh well I’ll be recording it anyway to skip the commercials. By all reports a wonderful series and should be on the ABC. 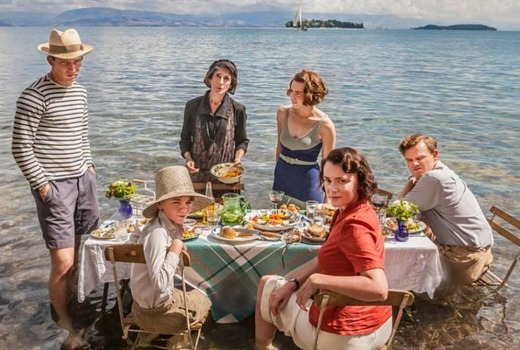 Prosperos Cell, the Alexandria Quartet , My Family and other Animals, all classics and all written by the Durrells. And then there’s Corfu. Who needs Zumbo when you have The Durrells. Should be Sunday night at 7.30 !! Will zumbos be repeated anywhere? Would like to see it but it’s up against survivor and the block, I don’t like its chances. Nothing on the secret daughter? Would have thought that would be Thursday nights but maybe they might do Sunday for that. Based on past scheduling Zumbo is sure to be repeated Friday after Better Homes. Rest assured, the networks will have encores galore for us to catch up. I reckon TEN will also repeat Survivor after the HYBPA encore on Friday night (and possibly again on Saturday on any of their channels). Nine is harder to tell. Code Black is nowhere near as good as ER or Greys Anatomy. Looking forward to seeing new eps of Chicago Fire. Whilst I’m curious about code black I’m reluctant to try it because 7 doesn’t do well on Thursdays, we are so far behind in episodes as it was not fast tracked and it’s not a show that will attract a huge following so I can see 7 playing around with the schedule. So I’d rather not commit to a new show then run the risk of chasing another show around the schedule and late changes. I wonder if Netflix will get the rights to it so I could watch it there. its about time Code Black is shown on Australian TV. the promo for the durrells looks silly in my opinion. Best guess Wednesday 9:30 Criminal Minds, yes I know that’ll be more like 9:47. Does Just Desserts really need to be on more than twice a week? Here we go again. Seems like a strong line up. Too much dessert (reality) as usual and I suspect that 800 words will not start at 8:30 Tuesday. Will 800 words have only 8 episodes or have they extended the season? Since I don’t get Pay TV I will enjoy same Selling Houses Australia. Seven is always gun shy on how many eps of their shows, for fear of tipping off rivals about programming. Thanks David. Shame they don’t care to let viewers know! Is Criminal Minds coming back? Aren’t there still a few episodes left? We want to know what happens to Morgan. Pity Selling Australia’s Australia on in Thursdays at 8! Clashed with The Bachelor and Goggle Box which both do well for 10. Will have to tape it, as I would like to see it. Noticed Survivor Aus on 10 is only on two nights a week – smart move and not overly saturated. May work well for 10. I was thinking the same. Selling Houses Australia would of been good to have on before the Olympics instead of all those LOL shows. 3 episodes a week seems a bit much for Zumbo’s dessert show. I have a feeling it won’t do very well against the Block and Survivor. cazz81: I agree. the second episode will drop by 28% from the premiere. May as well think that it might follow suit with Aussie BBQ Heroes.